What is Anti-Glomerular Basement Membrane Disease (also known as Goodpasture’s Syndrome)? How does Anti-GBM disease happen? Who gets Anti-Glomerular Basement Membrane Disease? What are my chances of getting better? 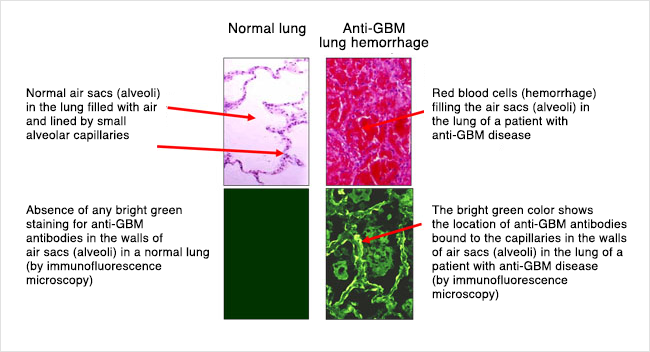 Anti-Glomerular Basement Membrane disease (anti-GBM disease) is a disease that occurs as a result of injury to small blood vessels (capillaries) in the kidneys and/or lungs. Autoantibodies are antibodies directed toward the body itself (rather than towards something foreign such as bacteria or viruses). In anti-GBM disease, these autoantibodies are targeted to the basement membrane, which is part of the wall of these capillary blood vessels in the kidneys and lungs. 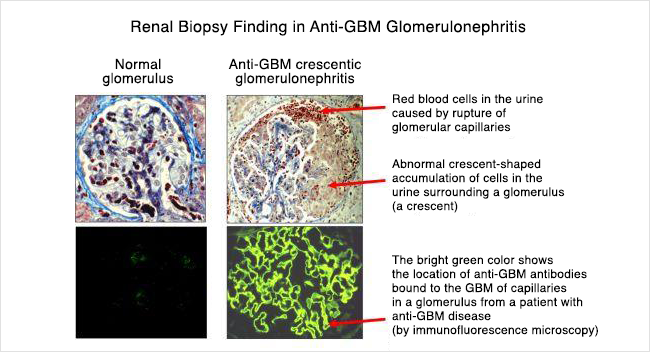 The name anti-GBM disease reflects the fact that this disease is caused by autoantibodies targeting and causing damage to (anti-) the glomerular basement membrane (GBM). Anti-GBM disease can affect just the kidneys or both the lungs and kidneys (it is uncommon for the only the lungs to be affected). The reason these organs are affected is because the basement membrane that is targeted or attacked in this disease is only accessible to antibodies in the kidneys and lungs (not in other organs). About half of people with anti-GBM disease have lung involvement. Anti-GBM disease that only affects the kidneys is called anti-GBM glomerulonephritis. This is because there is inflammation (-itis), occurring in the glomeruli (filters) of the kidney. Anti-GBM disease affecting both the kidneys and lungs is often called Goodpasture’s syndrome or Goodpasture’s disease (though anti-GBM disease is the preferred term now). In anti-GBM disease, the body creates autoantibodies that recognize and attach to the basement membrane, which is part of the wall of capillary blood vessels in the kidneys and lungs. Once the autoantibodies attach to the basement membrane, this creates a signal to the body’s immune system to attack. The immune system is designed to attack foreign invaders like infections, but in this disease the immune system becomes targeted to the body’s own tissues. Antibodies travel in the bloodstream until they find their target or the cell that they can attach to. White blood cells (leukocytes) are infection-fighting cells in the immune system and cause inflammation and injury to the cells “marked” by the antibodies – in this disease, to the capillary blood vessels in the kidneys and/or lungs. We do not know exactly why the body starts to make these autoantibodies, though there are probably multiple things that can contribute (such as genes and environmental exposures). In the kidneys, the autoantibodies damage capillaries (tiny blood vessels) within in the glomeruli. The glomeruli are the filters of the kidneys, which filter blood and make urine. Normally when blood goes through the capillaries in the glomeruli, water, electrolytes, and other substances are filtered from the blood into the urine, but larger things like blood cells and proteins are too big to pass through, so stay in the blood and do not pass through the filter into the urine. However, in anti-GBM disease, the glomeruli (filters) are damaged by the white blood cells and inflammation, and so protein and blood can pass into the urine. The protein and blood in the urine may not be visible but can be detected on urine tests or under the microscope. Protein in the urine can also cause the urine to look foamy. When the autoantibodies attach to the basement membrane in the glomerular capillaries, the inflammation and damage caused by the immune system can occur very quickly and causes the kidney function to decrease. Kidney function can drop very low in a short period of time – often days to a week or two. A lot of people with this disease can have severe kidney injury and damage to the point that they may require dialysis, either temporarily or long-term/permanently. In the lungs, the capillaries (blood vessels) that are attacked and damaged by the immune system are located in the thin walls of the air sacs where oxygen enters the blood and carbon dioxide exits. Injury to these pulmonary (lung) capillaries causes bleeding into these air sacs. When blood gets into these air sacs it can make it hard to breathe. Specifically, it can cause shortness of breath and low oxygen levels. People may cough up blood as well. Blood vessels, including capillaries, have a layer of cells called endothelial cells lining the inside of the blood vessel. These endothelial cells normally prevent antibodies in the bloodstream from coming into contact with the basement membrane (in the lungs or kidneys). 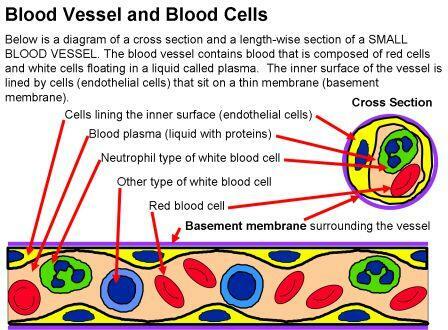 However, sometimes there the endothelial cells can become leaky or having spaces between cells that expose the basement membrane underneath, allowing anti-GBN antibodies in the bloodstream to reach the basement membrane and attach. Certain types of lung injury can cause the endothelial cells to become leaky or have gaps like this – including smoking and infections, as well as exposures to other inhaled substances like organic solvents or hydrocarbons and metal dusts. The drawing below shows how anti-GBM antibodies attach to capillary walls. This picture is a cross section of a capillary blood vessel. Gaps between the endothelial cells (yellow in this picture) allow the autoantibodies (anti-GBM antibodies) to get to the basement membrane (purple in this picture) and attach. 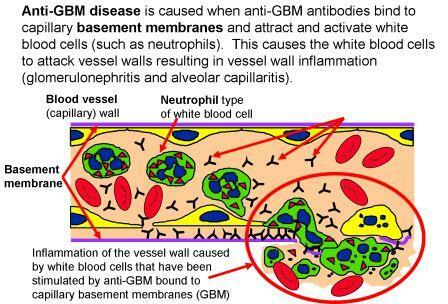 Once the anti-GBM autoantibodies attach to the basement membrane, they attract and activate white blood cells that cause inflammation and damage the capillary walls. Glomerulonephritis due to anti-GBM antibody disease is very rare. It occurs in less than 1 in a million people. It most commonly affects young, white men (aged 15-35). After young men, it occurs next most commonly in older adults (late 50s and beyond, women more than men). It is very rare in children. Low kidney function (kidney injury) or kidney failure, which can cause symptoms including fatigue, nausea/vomiting, poor appetite or weight loss, metallic taste in mouth, and confusion or decreased alertness. However, most people with kidney injury or damage do not have a lot of symptoms until they are in kidney failure. Sometimes if imaging (chest x-ray or CT scan) shows a problem in the lungs, or if someone is coughing up blood, a bronchoscopycan show whether there is bleeding in the lungs. Bronchoscopy is a procedure that uses a camera to look down the airway into the lungs. Anti-GBM antibodies can be checked (bloodwork) – this is an important part of making the diagnosis. Once the diagnosis is confirmed, treatment includes a few different parts. Anti-GBM disease can be life threatening due to bleeding in the lungs, and kidney failure can occur quickly, so starting treatment as soon as possible is important. If the lungs are involved, providing oxygen as needed to keep oxygen levels up. Sometimes, a breathing tube may be needed temporarily. If the kidneys have a lot of damage, they may not be able to function well enough to do what they need to, and dialysis may be needed to help do the kidneys’ job. This includes getting rid of fluid from the body, balancing electrolytes and acid-base levels in the blood, and removing toxins/wastes from the body. Plasmapheresis. This is a procedure that removes the anti-GBM antibody from the bloodstream. It can also be called plasma exchange or PLEX. A person’s blood is run through a machine that removes antibodies from the blood, then the blood is returned to the body (without the antibodies). Treatments last a couple hours and are usually done every 1-2 days for about 2 weeks. Corticosteroids– usually this is given as a high-dose infusion of a medication called methylprednisolone (Solumedrol) daily for 3 days. Treatment with an oral (by mouth) medication such as prednisone is typically continued after the infusion and tapered off over a period of 3-9 months. This medication decreases the inflammation caused by the immune system that contributes to kidney and lung damage. Cyclophosphamide (Cytoxan)– this is an immune suppressing medication that can be given as a monthly infusion or as a daily oral (by mouth) dose. This is generally continued for at least 2-3 months but up to 6 months. This medication helps to prevent the immune system from making more anti-GBM autoantibodies. Rituximab (Rituxan)- this is an immune suppressing medication that is given as an IV infusion, generally in 2-4 doses spaced over 2-4 weeks. This medication has not been evaluated in trials, but has been used in some patients – if cyclophosphamide is not a good option or in some patients in addition to cyclophosphamide. Other – other immunosuppressive medications such as mycophenolate mofetil or azathioprine have sometimes been used in this disease after treatment with cyclophosphamide or in combination with cyclophosphamide or other immunosuppressive medications. These medications are used much less commonly and in selected circumstances. They should not be the primary medication used to treat the disease as cyclophosphamide is the most effective medication from the evidence we have. Checking levels of the anti-GBM antibody in the blood after starting treatment is important to make sure that the antibody is being cleared from the blood and not returning. It can also help guide how long to continue treatment. Avoiding exposures that could cause or trigger the disease to return is important. Although a relapse or recurrent flare is uncommon, inhalation injuries (chemical exposures, such as organic solvents) or smoking cigarettes can be a trigger to cause the disease to come back. It is extremely important not to smoke cigarettes and to avoid cigarette smoke and other inhaled chemicals if you have had this disease. Anti-GBM disease progresses very quickly in most patients who get it. One of the most important things affecting how well somebody with anti-GBM disease does is how quickly they are treated. Since kidney disease or decreased kidney function does not cause many symptoms until the kidney function is extremely low, many people do not know they have disease until a significant amount of injury or damage has occurred. As many as half to two-thirds of people may end up with kidney failure from the disease. The severity of kidney injury at the time of diagnosis is one of the best predictors of how someone will do, though with treatment, some people who initially have kidney failure requiring dialysis can have improvement and may not need long-term dialysis. However, because the disease does not usually relapse or come back (see below), people who have good kidney function 6-12 months after getting the disease generally do very well. Once someone has had anti-GBM disease, a relapse of the disease is uncommon. However, 20-30% of people who have anti-GBM disease are also found to have another kind of autoantibody in their blood, called ANCA (which stands for anti-neutrophilic cytoplasmic antibodies). ANCA antibodies are associated with a different disease (ANCA vasculitis). In these 20-30% of patients with anti-GBM disease who also have ANCA antibodies in their blood, there is a much higher risk of the disease coming back or flaring again in the future. For this reason, testing for ANCA should be done in all patients with anti-GBM disease. For most people with anti-GBM disease who do not have ANCA antibodies, the disease rarely relapses once it happens (about 2-3%). When anti-GBM disease involves the kidneys, it can often lead to kidney failure. Fortunately, kidney transplant is an option for these patients. Read general information about kidney transplant here. Treatment of anti-GBM disease is focused on removing the anti-GBM antibody from the blood. Before having a kidney transplant, it is recommended that patients wait at least 6 months after finishing treatment and clearing the anti-GBM antibody from their blood. Once the disease is no longer active, transplant is a great option for many people. The chance that the anti-GBM disease will come back in the kidney is very low, occurring in less than 5% of patients. If it does come back in a transplanted kidney, the treatment is similar to what is done when it happens the first time in someone’s own kidneys – including plasmapheresis, corticosteroids, and cyclophosphamide (see above). This page was reviewed and updated in September 2018 by Shannon Murphy, MD.